Stephen Duncombe and I did a Center for Artistic Activism, Arts Action Academy workshop in St. Petersburg. The culmination was an impromptu beach, created along one of the normally unfriendly canals. The action was a comment on the gentrification happing in the area, while also acting as a proposal. Impromptu beach town appeared in this Friday in Kolomna. Action “our beach”, organized by the artists of the festival “MediaUdar ‘ , students’ art schools involved, “sociologists “Open Lab City” and indifferent citizens of the District of Kolomna, turned Seattle’s waterfront in the lively public space. 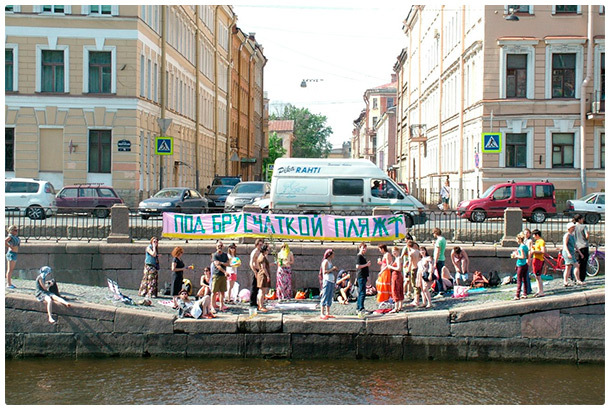 Thanks activists Planking descent to the Griboyedov Canal in Alarchina bridge suddenly turned into a bright area of recreation and entertainment. Anyone could stay in the water on the comfortable loungers, sun tan, drink a glass of cool juice, play ball or Frisbee and chat with neighbors. Organizers of the “beach” called their action “artistic proposal” for the residents. “We are not employees of the municipal government and can not guarantee that the beach will operate for a long time. Rather, it is an invitation: if the residents like it – they will develop the ideas that we offer on behalf of the art community and sociologists, “- said the coordinator of” MediaUdara “Tatiana Volkova.